ESP Auto Inc., Services: Tires | ESP Auto Inc. The tires you buy from E.S.P. Auto Inc. come with an extra insurance policy. It includes free replacement if your tire gets damaged during the first 12,000 miles or 1 year, plus you get a prorated credit based on tread depth after that. Road Hazard coverage is for damage that is unrepairable to the tread or sidewall from potholes, metal, nails, etc. If your tire can be repaired we will repair it or we will replace it for free or at a discounted price! 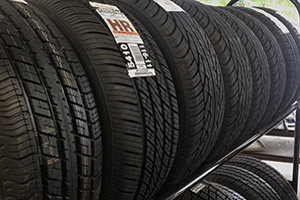 Contact us today if you would like to schedule an appointment for a replacement tires!